Police said they received cell phone video from an anonymous source of a child taking what appeared to be a bong hit while his mother -- identified as Rachelle L. Braaten, 24, of Centralia, Wash. -- held the pipe. *Editor's note: This image has been pixelated to protect the identity of the child. This is not the kind of higher education most parents support. 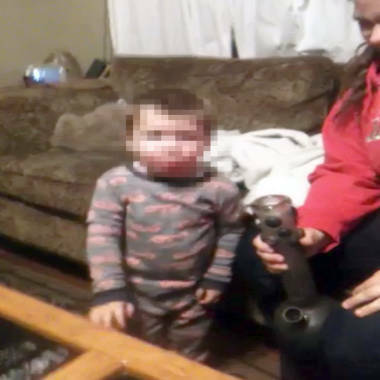 A Washington state mother is accused of letting her 22-month-old toddler smoke marijuana from a bong, police said. And when police went to couple’s home, they found 30-40 marijuana plants as well as firearms. The child’s father Tyler J. Lee, 25, was accused of unlawful possession of a firearm and manufacturing marijuana. The woman is being accused of unlawful delivery of a controlled substance to a minor as well as manufacturing marijuana. The boy and another child were taken into state custody after the arrests. A Seattle TV station obtained the cell phone video from Centralia police and posted it online. The video appears to show a child dressed in camouflage shirt briefly putting his face to the top of a lit water pipe. Lee was released on Monday pending charges, KOMO-TV reported. Braaten was booked into the Lewis County Jail and was still listed on the jail roster on Tuesday afternoon. Her bail was set at $20,000. In November, Washington state voters approved Initiative 502 making it legal for anyone 21 or over to possess up to an ounce of marijuana, 16 ounces of “solid marijuana-infused product” (pot brownies and such) or 72 ounces of “marijuana-infused liquid. However, it is still illegal to grow marijuana for recreational purposes in the state. The Washington Liquor Control Board was given until Dec. 1 to develop rules for implementing the law.